Capcom has revealed a special edition for its upcoming remake of Resident Evil 2. 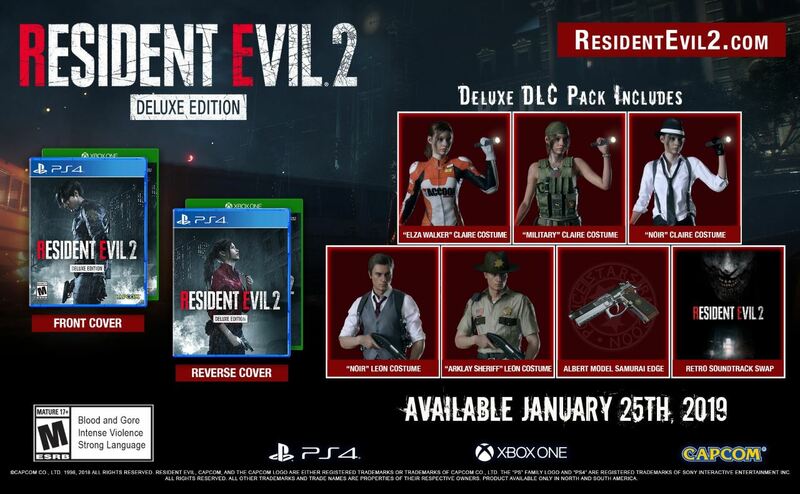 Called ‘Resident Evil 2: Deluxe Edition’, it comes with a couple of unique covers featuring the two protagonists – Leon S. Kennedy and Claire Redfield – in addition to a bunch of downloadable content (DLC), including five costumes, a weapon, and the soundtrack from the original 1998 release. The Deluxe Edition of Resident Evil 2 is already up for pre-order in the US at Amazon.com, Best Buy, and GameStop at $70 (about Rs. 5,200), which is $10 (about Rs. 740) more than the standard release. There’s no word on whether this special edition will be available in India, though given the game isn’t out for another three months, you should expect to hear something about a local release closer to launch date. Even the standard and Collector’s Edition, though listed on GamesTheShop, aren’t available for pre-order yet. If you don’t care about the special covers, you can get the other DLC benefits with the digitally-available Deluxe Edition as well. And it’s cheaper too: Rs. 3,499 on PC via Steam, Rs. 3,999 on PS4 via PlayStation Store, and Rs. 4,000 on Xbox One via Microsoft Store. Digital pre-orders also net you digital-only bonuses: two weapons called 'Samurai Edge - Chris Model' and 'Samurai Edge - Jill Model' on all platforms, Resident Evil 2 Special Theme on PS4, and Resident Evil 2 Wallpaper Pack on PC. Resident Evil 2 remake is slated to release January 25, 2019 on PC, PS4, and Xbox One. The game will be both PS4 Pro and Xbox One X Enhanced, offering either 4K resolution or 60fps support.